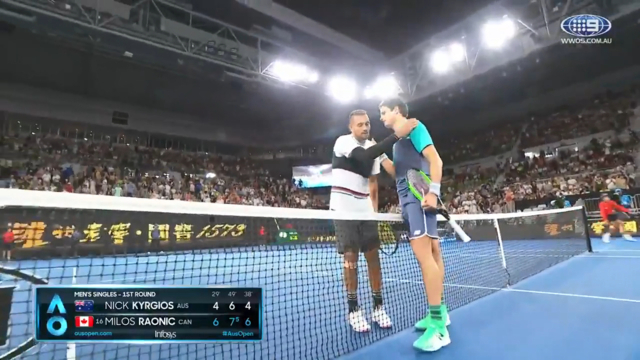 Nick Kyrgios has savaged the former coach of Lleyton Hewitt as the aftermath to Bernard Tomic's astonishing press conference following his first round Australian Open loss took another extraordinary twist. Kyrgios took to Twitter on Wednesday night to tear into Roger Rasheed over a radio interview on AFL commentator Gerard Healy's radio show, Sportsday. A fired-up Healy started the interview with some extremely critical observations about Kyrgios, Tomic and Thanasi Kokkinakis following their first round matches, with Kyrgios and Tomic going down in straight sets and Kokkinakis forced to withdraw with a shoulder injury. Healy was particularly scathing about the foot work of the trio, comparing them unfavourably to Roger Federer and making it clear that he felt it was an issue that could easily be fixed if they employed coaches. While initially cautious with his response, Rasheed made it clear that he agreed that all three players had their destiny in their own hands. "...we all see things from a lot of players but I suppose when the spotlight's on guys like that, I know things get exaggerated here but you're right, there's a reason for it and it's up to them," Rasheed said. "That's the reality of it, the thing with tennis that's like golf and it's not like sports like AFL or soccer or any team sport is you don't walk into a club and then have to follow a strong system, which is a club culture, which is a team culture, so you all go out there and have to deliver on the little things that are important to the team structure. "There's none of that in tennis and you're your own player. "Once you're outside the federation, you're getting coached by whoever you want to coach you, it's your journey, and the way you want to go down the road is up to you and then what's in front of you after that and I think that's about as basic as it is isn't it?" Those comments clearly didn't go over well with Kyrgios, who slammed Rasheed for discussing tennis issues with someone whose expertise is in AFL. "You blokes all have zero idea. It's comical people like yourself have an opinion of us. You blokes are anything but athletes, so how about you concentrate on your own s---. Zero credibility," Kyrgios said in his first tweet, sharing a link to the radio interview. In a second tweet he told Rasheed he "should be ashamed" before a third tweet said: "Like please explain to me the similarities between afl and tennis. Shut your mouth". The Twitter tirade came less than 24 hours after Kyrgios was unconvincing when asked to clarify if he had a rift with Hewitt following Tomic's bombshell press conference. After bursting onto the scene as teenagers all three of Kyrgios, Tomic and Kokkinakis have slid down the rankings, with reports about a split in Aussie men's tennis turning to wildfire on Monday night, leading to an emergency meeting between Hewitt and Tennis Australia and some bizarre answers to questions about a rift in Kyrgios and Kokkinakis' press conferences following their first round losses.